We know that feeling if you are unable to go home this Ugadi. Been there, done that. While we know there's nothing more than a homecooked meal, these restaurants in Hyderabad will cure your homesickness. At least a little. Get to Subbayya Gari Hotel in Kukatpally if you are craving an all-vegetarian heavy meal of authentic Andhra delicacies. The food is served on a proper banana leaf with Coastal Andhra specialties like Kakinada Kaja, Punugula Curry, poornam boore, boondi, tomato rice, pulav, pulihora, gutti vankaya, gongura avakayi, perugu wada, payasam, and more. The restaurant is generous with its quantities, and the staff is warm and urge you to try every dish. The ambience is simple but festive because of the constant banter. In fact, eating a meal here is a wonderful experience as we are served more than 20 varieties like a Pelli Bhojanam (Wedding food). If thalis are your thing, then you cannot miss out on the South Indian Thali at Spicy Venue. We love the dal and the flavoured rice and usually, keep asking the staff to refill our dal. Also what takes us back to Spicy Venue is — Apricot Delight — a custard-based dish that’s made from apricot and hits the right spot. Simply South by chef Chalapathi Rao does some of the best South Indian dishes, and if you love your rasam and sambar in the most authentic way, you got to eat here. Offering you the vibes of a true South Indian home, this restaurant will engulf you in its old-world charm with Carnatic music playing in the background. 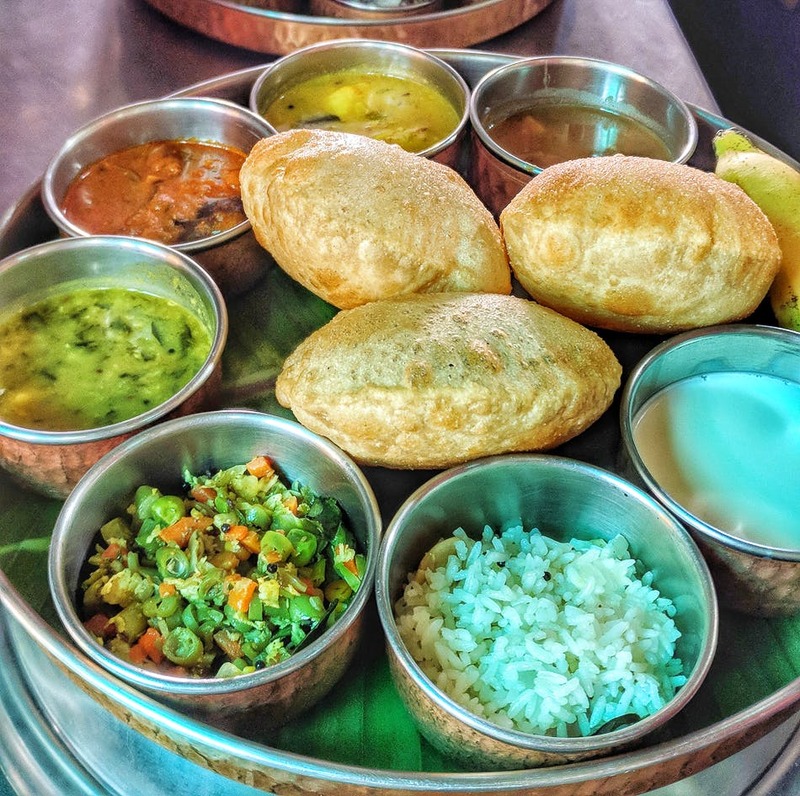 Go here for the South Indian Veg Thali which comes with the choicest of dishes – right from Bagara Rice (or any flavoured rice of the day), dal, curries, papad, and more. Sri Rama Mess (Or Raju Mess, as it's famously known) adds cool to the good old homemade food. This is the closest you can get to for a homemade meal which comes with unlimited rice, dal, curry of the day, chutney, pickle along with sambar and rasam. You cannot stop with one item as everything on the menu is delicious. Not too spicy, not too bland, just the right flavour. If you live in and around Secunderabad, go here. We insist! If all that takes to please you is well-cooked sambar rice or ulavacharu, head to Chaitanya Food Court in Kukatpally with a massive appetite and patience to get a table. This restaurant makes delicious Andhra delicacies and it's quite pocket-friendly too. So, if you're missing a simple homecooked meal with a generous helping of ghee, this restaurant beckons you. Taj Mahal Hotel in Abids is a classic when it comes to South Indian meals or tiffins, and for years now, this is where we go to tuck into a delicious thali. This comes with dal, curries, chutney, papad, rasam, and you'll walk into food coma, right after the meal.